A pair of center running left turn lanes on the 40s Bikeway allow bicyclists to cross an offset intersection in two-stages and provide refuge outside of the travel lanes. 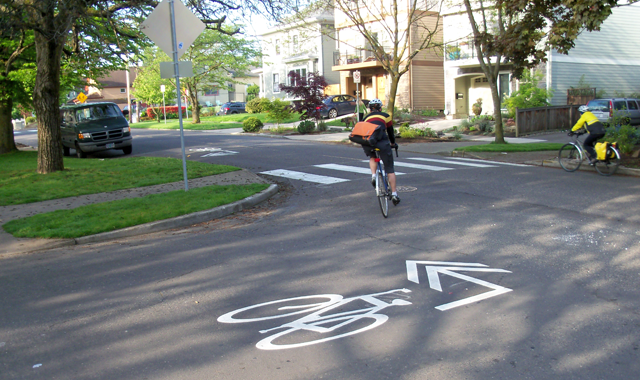 A median refuge island protects a left-turn lane designed to simplify an offset trail crossing. This short two-way cycle track on the Going Street Bicycle Boulevard connects a left-jog across a street with no bicycle facilities. 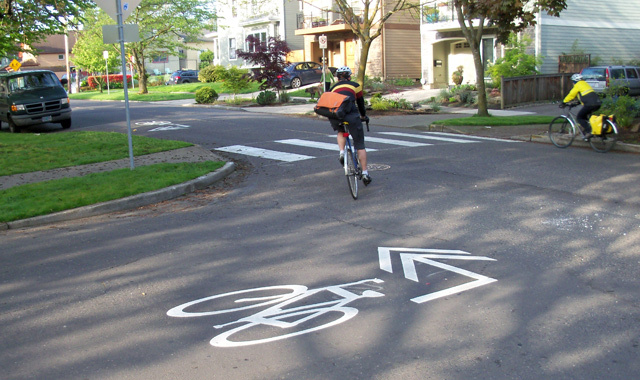 A modified shared lane marking directs people on bikes to the next link in a bicycle boulevard. These bicycle left turn lanes on the 40s Bikeway connect a right-jog across a street with no bicycle facilities. Offset Intersections are junctions at which two streets in a designated bicycle boulevard corridor align asymmetrically with an intersecting roadway. Since bicycle boulevards typically utilize local streets, bicyclists are likely to encounter discontinuities in the street grid that require them to turn briefly onto another street before resuming their original direction. Offset intersection treatments are categorized into treatments for major street crossing and treatments for minor street crossings. Selection of the appropriate treatment depends on the width and traffic characteristics of the intersecting street and on whether the bicycle boulevard jogs to the right or to the left. If an intersecting street has traffic speeds and volumes equivalent to the bicycle boulevard, no treatment is needed, although wayfinding (signing and pavement markings) should clearly direct bicyclists through the offset. This is the preferred situation. 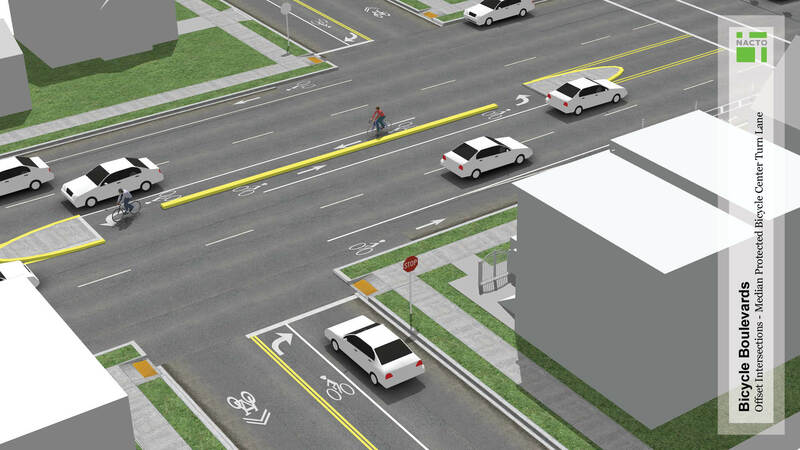 When a bicycle boulevard crosses a major street at an offset intersection, additional corridor and crossing treatments may be required to preserve the attractiveness and comfort of the bicycle boulevard. 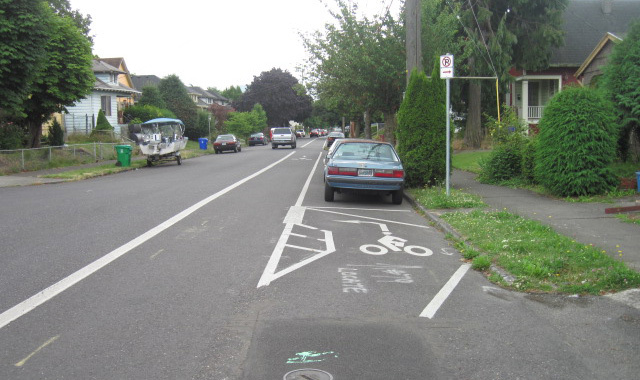 On a minor collector street without bike lanes or where bike lanes are present, a two-stage turn queue box placed in the on-street parking lane can allow bicyclists to reposition themselves and wait for a crossing opportunity. This is particularly important where the connecting street has continuous bike lanes so that bicycle boulevard traffic will not block the bike lane while waiting for a gap in traffic. It can be combined with a crosswalk and/or median island depending on the operational characteristics of the cross street. Each bicycle left-turn lane should be at least 4 feet wide (total width of 8 feet), with 6 feet preferred (total width of 12 feet). This treatment is appropriate for relatively short jogs. Hendrix, Michael. (2007). 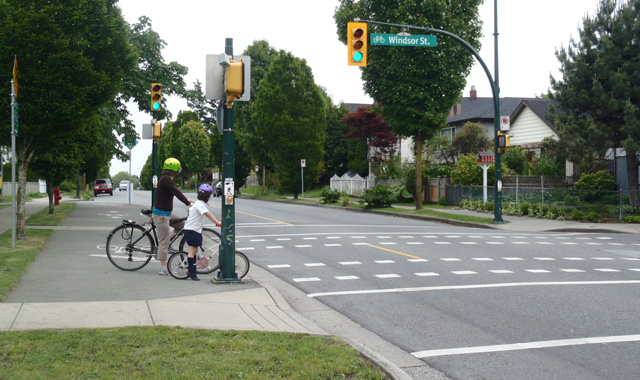 Responding to the Challenges of Bicycle Crossings at Offset Intersections. Third Urban Street Symposium. This treatment is not appropriate if the cross street has more than one lane per direction or has a posted speed above 30 mph. 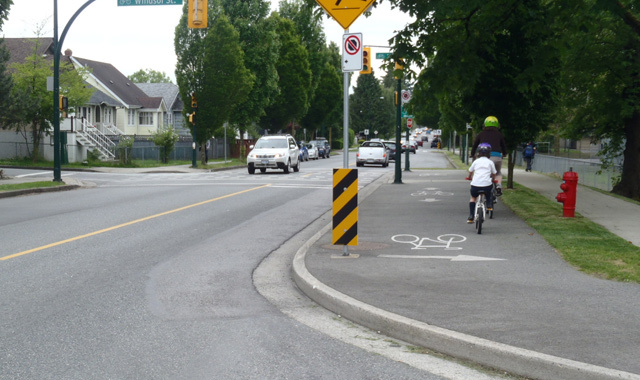 A raised median with a small opening for bikes may be used to prohibit motor vehicles from continuing on the bicycle boulevard or turning left from the cross street. Green coloration may be used in the bike lane area to improve its visibility, as well as median islands at either end for protection from motor vehicle traffic. At an offset intersection where a signal exists, signal phasing can accommodate bicyclists riding through the intersection. 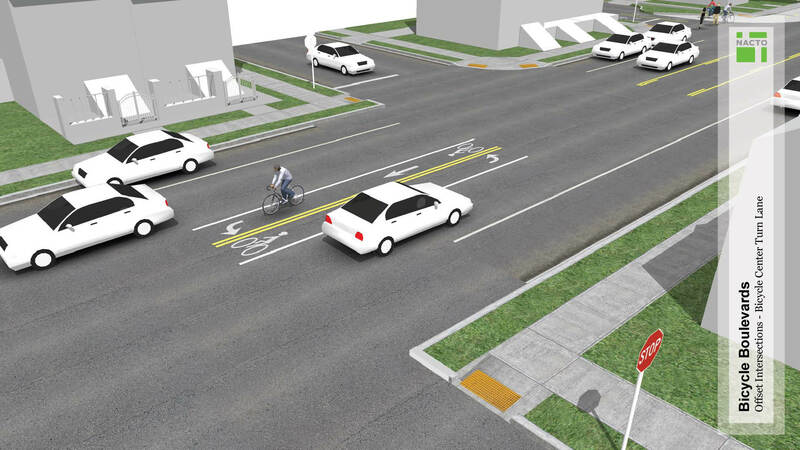 This treatment will require a longer phase on the major street than a standard intersection, as it should provide sufficient time for bicyclists to travel through the jog. 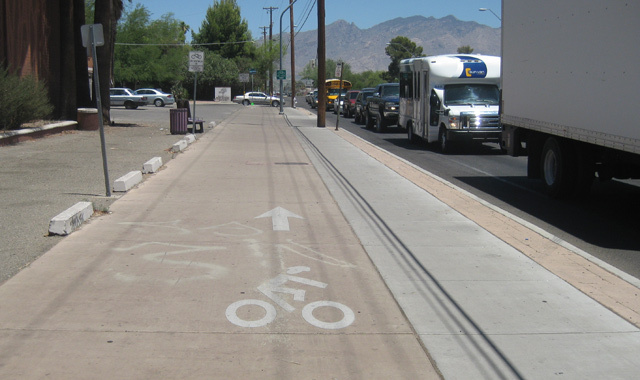 A pair of one-way cycle tracks can be used along the section of roadway connecting the offset segments of a bicycle boulevard. This treatment requires crossing treatments on both sides of the facility, and may facilitate wrong-way riding on the cycle track. A two-way cycle track has the advantage of diverting bicyclists traveling in either direction on a bicycle boulevard to a single crossing location. This minimizes the cost of the crossing treatments and enables the use of beacons and signals, which cannot be used in close proximity. 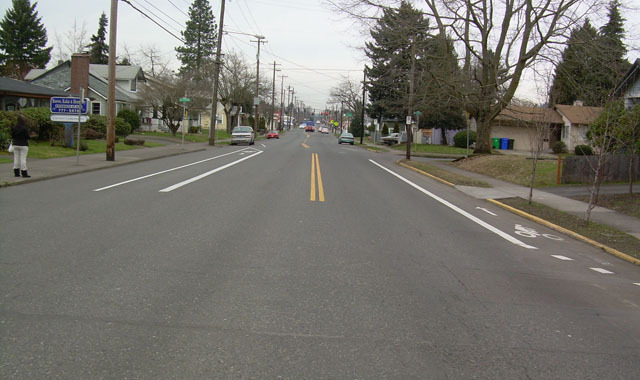 A median island is similar to the center turn lane treatment, except an extruded curb end cap provides more of a buffer than just paint. This type of crossing can be used to accommodate a jog in either direction, as bicyclists can cross one lane of traffic and ride in the median. 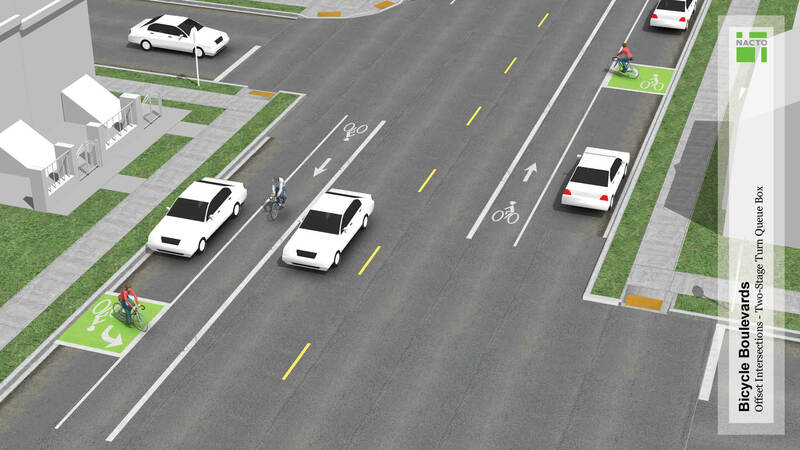 If the connecting street is one way for motor vehicle traffic, consider allowing bicyclists to travel against the flow of traffic using a contra-flow bike lane. Contra-flow bike lanes are installed on one side of the street facing one-way vehicle traffic. Click on the images below to view 3D concepts of offset intersection treatments. 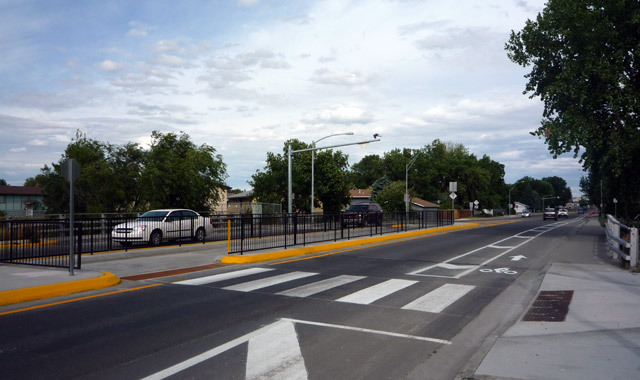 Provides safer conditions for crossing and turning, and prevents the short route section along the connecting street from becoming the “weak link in the chain,” which lowers the comfort and safety level of the entire route. 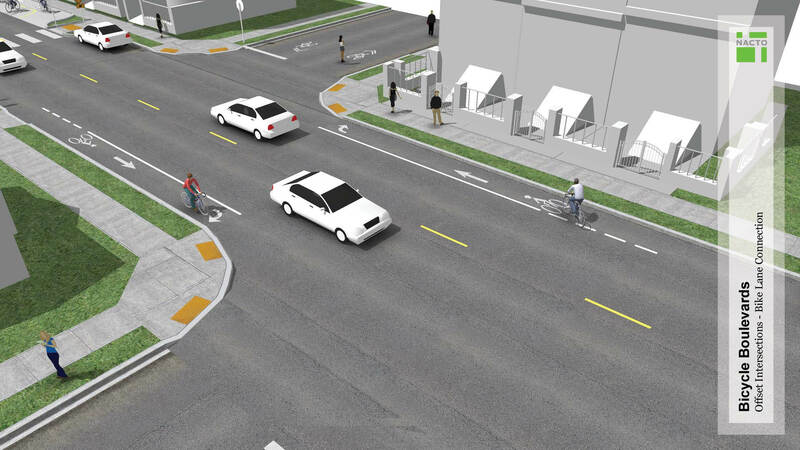 Provides continuity to bicycle boulevard routes over a discontinuous local street network. Adds comfort and wayfinding elements to jogs along the bicycle boulevard, particularly important along busier cross streets. Where a bicycle boulevard has to turn or travels for a brief distance on another street. Wayfinding signs shall be provided to indicate the change in direction when a bicycle boulevard turns. 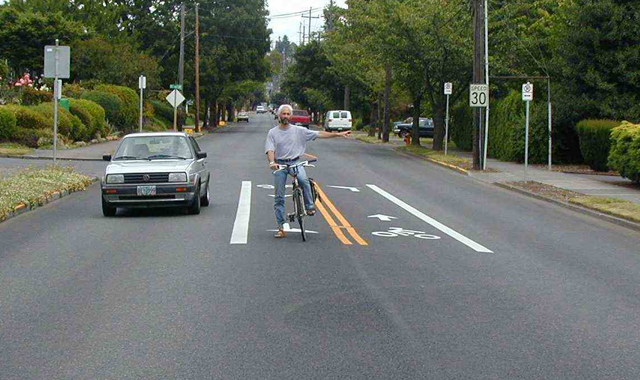 Appropriate bicycle facilities (shared lane markings, bike lanes, cycle tracks, etc.) shall be used on the street onto which bicyclists turn when a bicycle boulevard jogs. 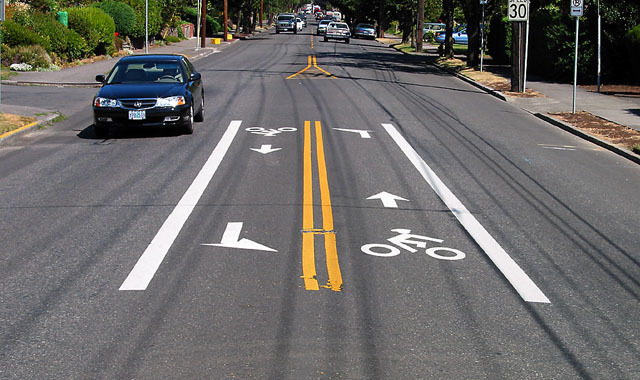 Crossing treatments appropriate to the roadway characteristics shall be provided to assist bicyclists in crossing the roadway or making turning movements in order to stay on the bicycle boulevard. A refuge island may be provided to make a two-step crossing for path users at a complex crossing. American Association of State Highway and Transportation Officials (AASHTO). (1999). 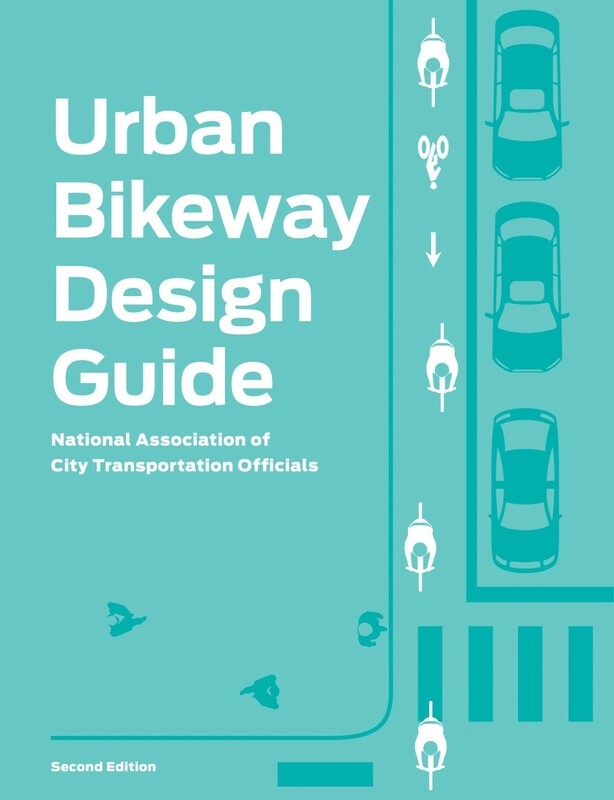 Guide for the Development of Bicycle Facilities. 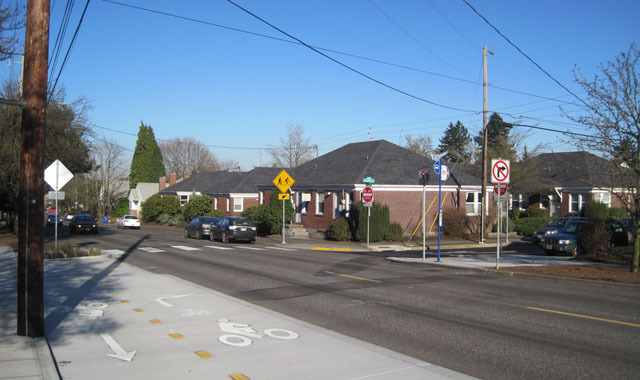 If the bicycle boulevard turns onto a street with another bikeway, treatments should provide sufficient space for users turning onto the bicycle boulevard to wait for a crossing opportunity without blocking users continuing on the bikeway. Pavement markings indicating the change in direction from the bicycle boulevard may supplement wayfinding signs on the approach to a jog. Paint can wear more quickly in high traffic areas or in winter climates. Facilities should be cleared of snow through routine snow removal operations. 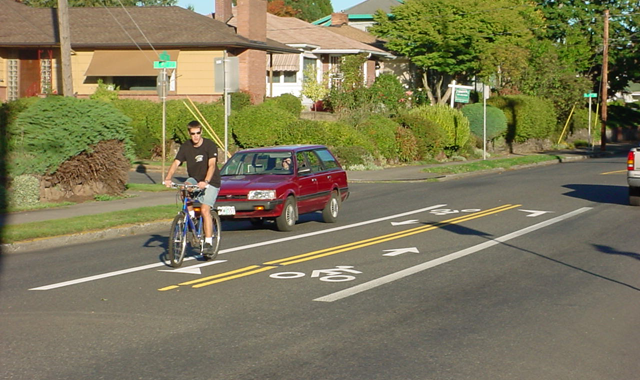 AASHTO’s Bicycle Facilities Design Guidelines document describes a long median that bicyclists can use to navigate an offset intersection along a trail. 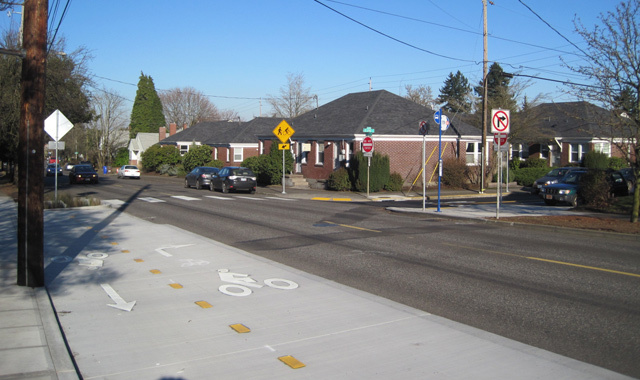 Portland, OR, and Tucson, AZ, use a short cycle track to provide enhanced bicycle access along a busy street to make a connection to bikeways on lower-speed streets. References for Offset Intersections: 3 found. Hendrix, Michael. 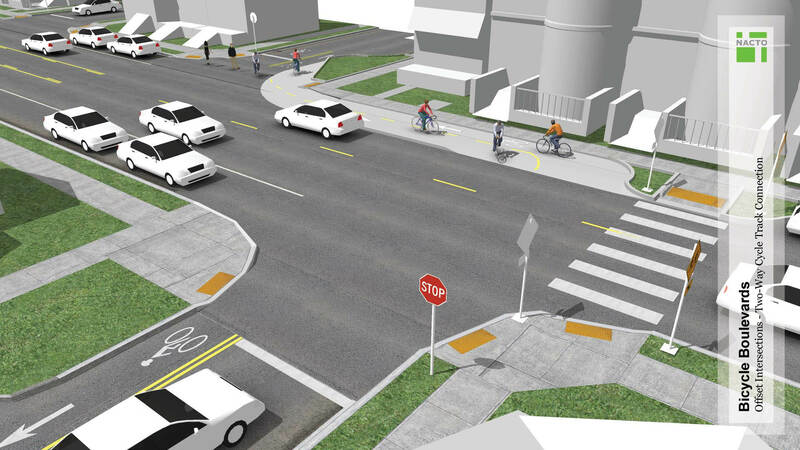 "Responding to the Challenges of Bicycle Crossings at Offset Intersections." 3rd Urban Street Symposium, Transportation Research Board, Seattle, WA.